Saw scan, did it, took a while, played a while, finished today. I hope it's likable to the crowd at the least. Too lazy to write an essay about progression. You know the drill. Ah right...a little thing about the filters. It is slightly yellowish, I thought it was too "cold" on my screen (it is really light saturated, so hard to judge). Seeing it on a different one kind of makes me think it was too much. I'll edit if it bothers people, but I'm glad I could keep the colours quite nicely. Overal satisfied, even if I had no clue what I was doing. Guess it's fine like this. I got kinda stuck, but I'm happy to submit something and finish it after some time. 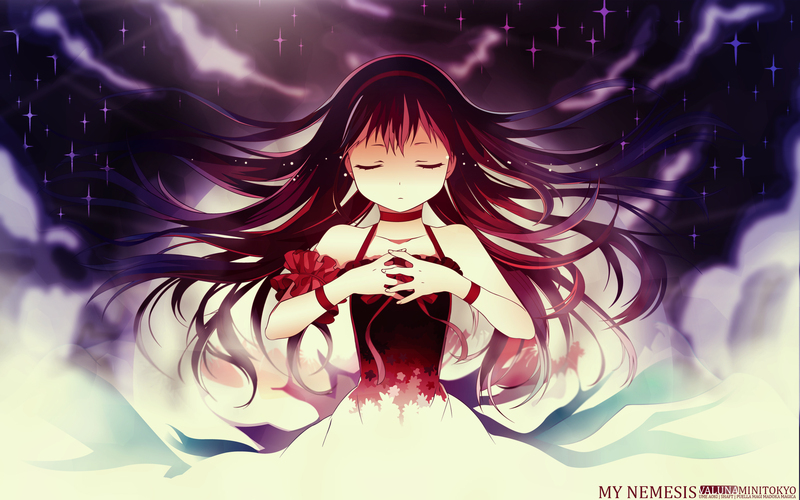 Browse Puella Magi Madoka Magica Gallery: Recent | Popular. I sense laziness at work *squints* But I'll let it slide since you made a vector wall with sparkles and I got joy out of adding the Sparkles tag to it. Overall I like this, especially the pink and mauve and red hues. IMO the yellow looks good; it does keep everything from looking too cold, so good call on that. Something as small as an overlay effect can do wonders sometimes. The gradients are what make this wall look as appealing as it does, though; the way they change from one strand of hair to another, without looking out of place, really shows you have a good eye for coordinating colors and bringing different hues together well. The fadeout effect on her dress is pretty neat too! That being said, I'm not too keen on the sparkles themselves. They do vary in size and color (I like that they "follow" the gradient in the background), but they're...identical in look. Blurring a few of them would help blend them in with everything better - especially with the blurred part of her hair and smoke. Not too sure about the sparkles on the left - the ones overlapping her hair; with the low opacity (due to Overlay? ), they look more solid than not, whereas they're supposed to be particles of light. Low opacity isn't bad at all, but I personally would have them looking more solid (less transparent) and brighter at the center, with the edges slowly becoming more and more see-through. And speaking of her hair, is it blurry due to the smoke covering it, or the distance? It seems strange that only part of it is blurred, instead of the entire strands; it does make for a nice look on the left side, which I admit I haven't seen too often and resulted in an appreciative eyebrow raise. Also, I don't know if it was intentional or not (maybe I'm blind and missing something), but there are some strange, sharp shapes in the background, like on the right of her head (overlapping the clouds) and on the left (clouds too). They look like rough shapes with low opacity. Barring this, it's a pretty good wall. The part I like most is the hair, if only for the way you played with the gradients. Vector quality is top notch, as usual, and the tears are a nice detail. *thumbs up* You keep doing that good work you do, Val. I love Homura (and PMMM in general). The girls' dresses are so colorful and vivid, and I'd say that makes PMMM scans a perfect choice for your walls. In any case, I like how the colors change from blue in the edges of the wall to purple and claret on Homura's hair and finally orange and yellow on her skin. That really gives the center of the wall a feel of warmth. I would say I only miss either more shadows on Homura's face and arms or some more light over her skin as if she was performing a spell. Except for that, this is beautiful. Ooh, this looks pretty spiffy! Love the vector and the gradients in her hair, as many have mentioned. I have to agree with Pande about those sparkles (maybe some more realistic lights/stars/sparkles would look better and more magical, dunno) and those odd shapes all around her. I also think the clouds are a bit too blurred and look like squiggly worms lol but other than that, it's a very nice wall; the colors are all well used and the tears are a nice touch, too. The character's vectoring is so awesomely done ! And nice balance of colors, they match together well !